Learn which mulch to use, how much and where to put it. Soil is alive! Billions of soil organisms create soil structure that allows air, water, and plant roots into the soil, while recycling nutrients, storing water, and protecting plants from disease. Those organisms live on organic matter such as dead leaves, mulch, and compost. 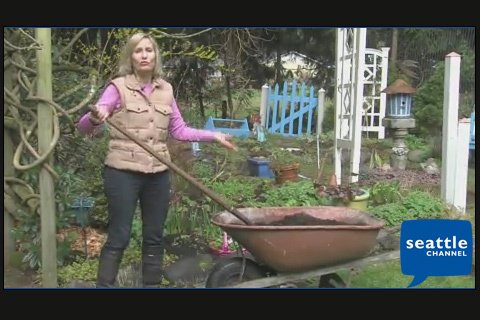 Dig or rototill compost into the soil before planting. Gardens: mix 2-3 inches of compost 8-12 inches deep. Use less on clay soils, more on sandy soils. Amend the whole bed, not just planting holes. For existing gardens, add 1 inch every year or two. Mulch is any organic material spread on the surface to conserve water, control weeds, and slowly feed the soil. Different mulches work better for different plants. Flower beds and vegetable gardens: spread 1-3 inches of fall leaves, compost, grass clippings, or straw. Keep mulch at least an inch away from plant stems. Trees, shrubs, and perennials: spread 2-4 inches of woody mulches, like wood chips (often available free from a tree service) or coarse bark (fine bark can plug the soil). Fall leaves also work well to prevent winter weeds and soil erosion. Lawns: mulch mow (leave the clippings). On lawns in poor condition, aerate and then rake in ½ inch of compost in spring or fall. Where to buy compost and mulch? Cedar Grove composts our yard and food waste, and sells compost in bags or bulk directly and through local nurseries and garden stores. Call the Garden Hotline for a supplier near you. Fall leaves make a great free mulch. Arborist wood chips are often free from tree services. Cedar Grove and other suppliers sell wood chip mulch in bulk, or it’s available in bags at garden stores. The Garden Hotline can help with other mulch ideas and local sources.